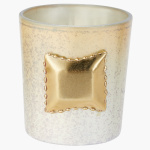 Grab this votive candle holder for enhancing the beauty of your home decor. The textured metallic finish gives this piece a fine luxurious appeal. A perfect piece to enhance the look of your home decor during festivals or special occasions.